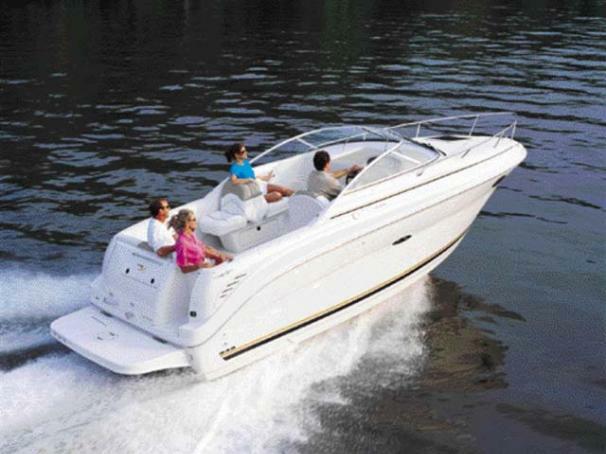 Boat Description The Sea Ray 245 Weekender is designed to be the perfect boat for weekends. Down below, the upholstered V-berth sleeps two at night when the filler cushions are added, and with the dining table in place, it`s great for meals. The standup head compartment includes a pump-out toilet. In the cockpit, aft jump seats form a comfortable bench across the stern. A gas-assisted insulated motorbox provides easy access to the engine. A starboard transom door leads to the swim platform. The back-to-back portside seat is fantastic when there are skiers or kneeboarders in the water. Integral cabin steps provide easy access to the foredeck. The helm has custom backlit instrumentation, a Lowrance 3500 depth finder, and an illuminated waterproof electronic switch pad with ISO symbols. Standard power is a 5.0L Bravo II MCM stern drive.